Remember that Existence is purposeful.It always was, is, and shall be. Whether we speak of the life of an atom, a man, a planet, a solar system, a central sun or a galaxy, each has its period of Involution, or involving itself into matter, and its period of Evolution, or evolving out of matter, out of form-living. Only the scale or size is different; the principle is the same. Whether or not Humanity believes it, Mankind is undergoing a purposeful development (Involution and Evolution) guided by many different kinds of Intelligences (Devas, angels, nature-spirits, and so on) throughout its long course of Involution-Evolution. The Human and Angelic Hierarchies each have a Divine Plan for their evolutionary development. Human Souls descended from a more perfect state of existence so that they may master the Physical Plane and develop full Divine Consciousness upon Earth while in physical bodies. That was the original Divine Plan for Mankind: by the Divinization of Life upon Earth, Mankind was to spiritualize this planet, and hence the physical universe. To accomplish this, Man first had to develop self-consciousness and an ego. This led to Man’s separation in consciousness from one another and from the Divine within, leading to conflict, strife and wars. A long series of incarnations became necessary and Evolution is but a slow learning process. On this planet Earth, Mankind has reached the midpoint of Involution-​Evolution: the densest materiality, the densest material bodies and the densest plane (the Physical Plane of matter). From now on, over many Ages, Man will undergo a gradual refinement. The next stage is that Man has to learn to serve, to practise self-​sacrifice, outwardly to be at-one with all Life, and to ascend inwardly, by way of meditation, to the Throne of God. 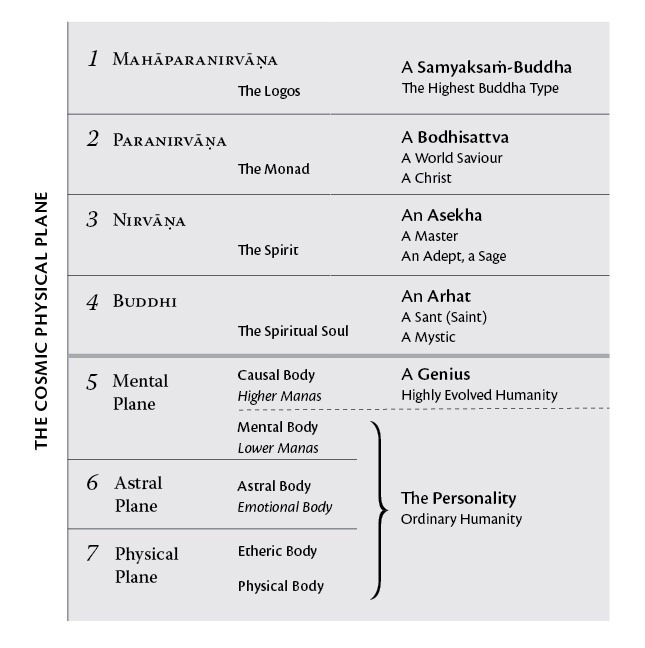 In time, all of Mankind will reach the Nirvāṇic Plane. In the larger view of Evolution we have descended from the Spiritual Realms, the Paranirvāṇic Plane, down to the Physical Plane, our condition of matter, which includes the four etheric subplanes. On the upward arc of Evolution we first had to become consciouson the Physical Plane, then on the Astral. At this time, Humanity is mastering the Mental Plane. 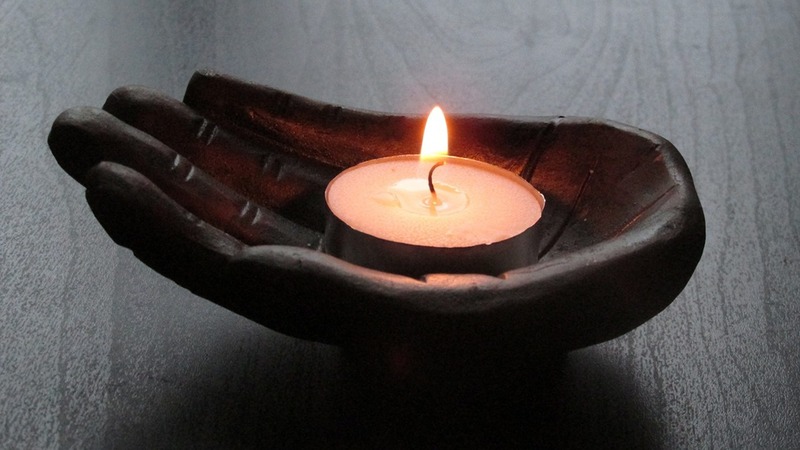 Those who are of the future race, however, focus on Buddhic and Nirvāṇic development. In future Ages, Human Evolution on this planet will concern itself with the Nirvāṇic Plane, the Kingdom of God, in the Nirvāṇic Body and the Head Cakra. Thus, you see, Evolution moves progressively upwards. 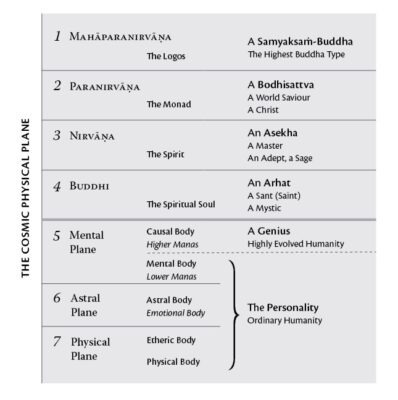 At the close of this Manvantara, at the end of the great Evolutionary Unfoldment of this Incarnation of God, the Perfected Man (Super-Man or Divine Man) will be able to perceive and function simultaneouslyupon all seven subplanes of the Cosmic Physical Plane, the seven great Planes of Being. That is, you will be able to function simultaneously upon the Physical Plane, the Astral Plane, the Mental Plane, the Buddhic Plane, the Nirvāṇic Plane, the Paranirvāṇic Plane and the Mahāparanirvāṇic Plane. Strictly speaking, by then you will be well above the human species, in the Kingdom of the Gods. While, at this stage, this is not possible for most humans on this planet, it is the far-off goal of the Incarnating God for this Humanity. For now, you still live by choiceon some plane or another of the great House of the Father, the Cosmic Physical Plane of our Solar System. The purpose of the long evolutionary process for Man on this planet is to acquire objective consciousness or self-consciousness in the Three Worlds (the Physical, Astral and Mental Planes) in the five bodies (physical, etheric, astral, mental and causal), before moving on to higher and more spiritual evolutionary processes upon the planes above (Buddhi, Nirvāṇa, and beyond). Each plane, world, realm or state of matter that you experience is “real”, or objective, when you are conscious in that world. Every plane that you do not consciously experience is subjective,hidden, but that does not mean it does not exist! Just as you have to develop your five physical senses to perceive this world, you must develop the senses of your etheric, astral, mental and causal bodies to perceive the Three Worlds. This development of the senses of perception on the inner worlds is part of the evolutionary process. At first, every plane or world is subjective or subconscious, meaning below your conscious level of experience. The goal of Evolution is to bring each realm into objective consciousness. Initially, this is done through a long series of cyclic incarnations (Reincarnation). As your consciousness develops, however, you evolve more rapidly and intelligently by the consciouseffort of following the Spiritual Path. This entry was posted in Imre Vallyon Teachings and tagged evolution, Imre Vallyon, involution, miracles.